We are at the finish line; this is the last day of the month and, therefore, the last chapter in the book of Proverbs. 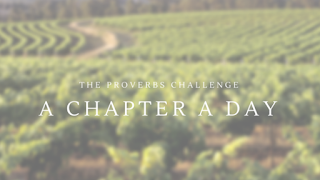 As they told me when I completed the Carlsbad Half Marathon - "look ahead, you can see the finish line; be sure to smile as you cross the finish line.” So let's compose ourselves, one last time and smile as we finish by reading Proverbs 31. There are two women noted in this chapter - one we've heard about - the virtuous woman; and the other one is hardly mentioned - Lemuel's mother. It is not certain who King Lemuel was, but his mother was clearly a wise woman who gave her son sage advice. As a King, someone in a position of authority, he took his mother's advice to heart. She encouraged him to be a righteous leader, one who is discerning, fair, and smart in his associations. Throughout Proverbs, we have seen the benefits of being a righteous leader. I have had a love/hate relationship with the woman described in verses 10-31 commonly called the virtuous woman. Initially, I thought it was an unrealistic standard to which I could never measure up. I also mistakenly felt that it was used to keep women in their place. Then I rediscovered it and realized that she is quite a well-rounded woman and it is something I aspire to. (This is why it's important to know the Word for yourself). Did you know that the target audience for this chapter is men, not women? In the Jewish culture, men memorize this passage and sing it as a song of praise to the women in their lives. (Now, I could get used to that (smile!)). The virtuous woman is about her character, not her role. The virtuous woman is hard working, has her family's best interest at heart, does what she needs to do so that they have what they need, is creative, an entrepreneur, dresses well, takes care of herself (she girds her loins with strength and strengthens her arms (v 17)), is perceptive, and compassionate. She speaks wise words and is not idle. Because of who she is and what she does, her husband is respected. She is more than a wife, she is the total package; she is a woman of bravery, wisdom, and strength. But this woman does not reap all the rewards immediately - strength and honor are her clothing and she shall rejoice in time to come (v25). Being this kind of woman is hard - sometimes you're tired (bone weary tired) and you want to snap; sometimes you may even feel unappreciated. But keeping what is important in mind, you press on. There comes a time when her children rise up and call her blessed and her husband praises her (v28-29). It takes time to become this virtuous woman. How fitting that the book of Proverbs should end on such a high note for women. I’ve enjoyed doing this challenge; I hope you have too. In a couple of days, I’ll provide my overall reflections. Great job with this entire series and congratulations on sticking to your chapter a day! Making time to write is surely a commitment. Blessings!